Yes, those are indeed tech fittings you see at the heel and toe of Tecnica's new Cochise Pro Light ski boot, and believe me, they're not just for decoration. The Cochise Pro Light joins a host of new touring-oriented ski boots from Alpine makers who are now testing the A/T waters. Where their peers have just been dipping a toe, however, Tecnica gives us a cannonball splash. The three-buckle Pro Light is a true touring boot, built to climb, with a fully-realized walk mode that feels very much like a Scarpa or Garmont offering. In fact, if you're going to criticize it, you may find yourself in the odd position of thinking the Cochise Pro Light tilts a little too much toward the touring end of the spectrum. That doesn't mean the boot under-performs going down the hill—far from it. Rather, the Pro Light just doesn't offer as refined a fit and feel as you'd expect given the pedigree. Either way, in walk mode, range of motion is good and freedom of motion is excellent. The Cochise Pro Light weighs a half ounce more than a Garmont Radium and delivers at least as good a touring mode. The easy feel of the Cochise Pro Light in walk mode is simply a huge surprise. Another big surprise is how stiff the boot proves to be in ski mode. Click into downhill mode and STIFF is the impression that hits you and your shins right away. My subjective stiff-o-meter places the Pro Light well beyond the on-the-hill feel of both the Cosmos and Maestrale RS—both of which are four-buckle boots. 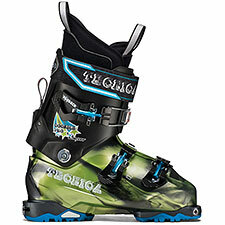 Shift from loosey-goosey touring mode to ski mode, and the cuff goes practically rock hard. The bad news is it's not the most progressive flex. The good news is you may not care, if Alpine-level stiffness is what you're after. You'll have no trouble driving today's big freeride planks with the Cochise Pro Light, even on hard snow. Just beware: as with Garmont's Radium, this level of stiffness can become a liability as tours get longer. In terms of comfort, the liners on my demo pair were admittedly past their prime, but even given that, my fear is they don't provide enough cushion to adequately deal with the shell's stiffness. As crazy as it sounds for a three-buckle boot, shin bang is a real possibility. Along with the liner, there are some indications the Cochise Pro Light is a work in progress. The boot has a boxy, high-volume fit, with an inexplicable abundance of volume in the upper cuff.